This is a official site of Hachimantai Onuma CHAYAKO. Hachimantai Onuma is the lake in the side in Hachimantai of altitude 1614m. Our hotel is in lakeside in Hachimantai Onuma. 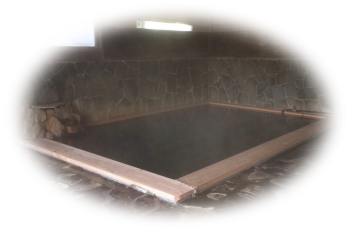 This is one of natural hot spring in Hachimantai, it's known that there are many hot springs. The beautiful scenery and a hot spring of Hachimantai Onuma would make your travel more happy. Our business starts from April 1, 2017. And later, we will welcome you all throgh the year. We're waiting for your booking. Hachimantai Aspiteline and Jukailine are roads closing in winter from November to April. We have an inner bath and an outdoor bath for men and women. Our guests can take a bath between 6:00 and 24:00. When you want to take a bath, please use it freely. You can take a buth between 10:00 and 16:30. 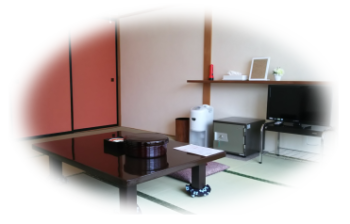 We have 6 guests rooms where tatami was laid out, Japanese-style rooms. When using a room alone: 9,870 yen, Tax included . When using a room with two or more people: 8,790 yen, Tax included . 5,000 yen per one person, Tax included . When using a room alone: 12,030 yen, Tax included . When using a room with two or more people: 10,950 yen, Tax included . 6,000 yen per one person, Tax included . Yukata, Towels, Tooth brushes, and rooms are included. Local foods such as Sansai (Mountain vegetables) dishes, Akita local specialty Kiritanpo Nabe are served in washoku zen. And you can also eat sashimi of rainbow trout, tempura, soba etc. Please enjoy the seasonal food of Hachimantai. Dinner time, meals are served at the restaurant on 1F from 18 o'clock to 20 o'clock. And breakfast time is from 6 o'clock to 8 o'clock. 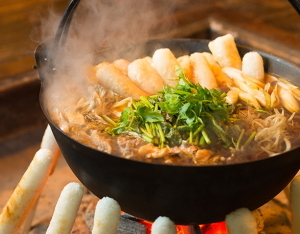 Kiritanpo nabe is known as a local food of Akita. 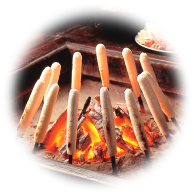 We boil Tanpo, it is a stick-shaped food made with rice, and chicken(Hinai Jidori) and green onion and so on in soy sauce soup. The taste of chicken and vegitables stains in Tnapo, it is very delicious. Please try Kiritanpo nabe at Hachimantai Onuma CHAYAKO. There are wide range of tourism spots you can visit in Hachimantai. Primarily, Hachimantai Onuma is in front of us. It fascinates us throughout the year with its beauty, spring, summer, autumn, and winter. Secondly, there are several trekking routes in Hachimantai. If you like trekking in nature, Hachimantai meets your expectations. Please feel the breath of nature, including forest bathing. Hachiman numa, Goshogake Promenade, Yakeyama,and so on. 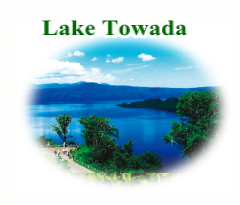 Third, if you want to see a beautiful lake, Lake Towada satisfies your wishes. On lake side, there is a statue which is called "Otome no zo". It is popular with tourists. Because the pleasure boat sails on the lake, you may as well ride it. You can come to Hachimantai Onuma CHAYAKO with 3 routes. It takes about 40 minutes by car, or about 70 minutes by regular buses (So you must change from Shuhoku Bus to Ugo Kotsu Bus at Aspite Line entarance BS) from JR Kazunohanawa St. to Hachimantai Onuma CHAYAKO. 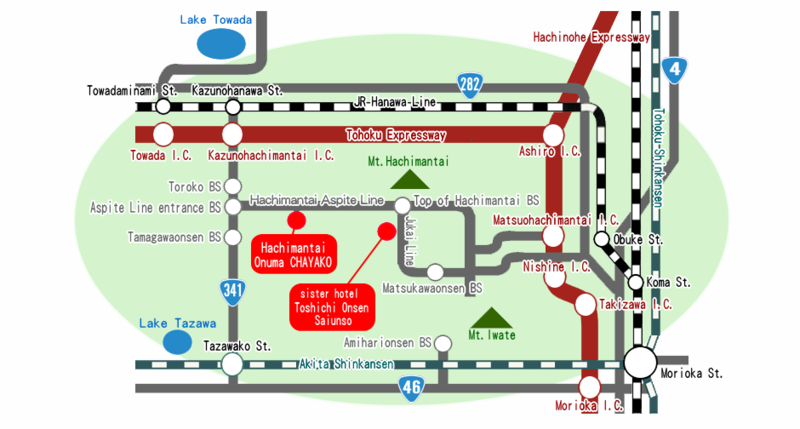 2.Route which comes here from JR Morioka station direction through Hachimantai Aspite Line or Jukai Line. It takes about 80 minutes by car, or about 150 minutes by regular buses (So you must change from Iwate kenpoku Bus to Ugo Kotsu Bus at Top of Mt.Hachimantai BS) from JR　Morioka St. to Hachimantai Onuma CHAYAKO. ※　In winter(November to April), so there are too much snow, you can not pass the road(Hachimantai Aspirete Line and Jukai Line). It takes about 70 minutes by car, or about 110 minutes by regular buses (Ugo Kotsu Bus) from JR　Morioka St. to Hachimantai Onuma CHAYAKO. ※　In winter(November to April), so there are too much snow, you can not pass the road(Route 341). Copyrightc Hachimantai Onuma CHAYAKO All rights reserved.